Death Penalty Sought In Killing Of Saudi Journalist - Joe.My.God. Saudi Arabia’s top prosecutor is recommending the death penalty for five suspects charged with ordering and carrying out the killing of Saudi writer Jamal Khashoggi, in a move that appears designed to protect the country’s powerful crown prince Mohammed bin Salman. A spokesman for Saudi Al-Mojeb told journalists in a rare press conference in Riyadh on Thursday that Khashoggi’s killers had set in motion plans for the killing on 29 September, three days before he was killed inside the kingdom’s consulate in Istanbul. Prince Mohammed was not implicated in the murder, he added. An official statement published by state news agency SPA said that a total of 21 individuals were in custody in connection with the killing, 11 of whom have been indicted with investigations to continue into the others. The dissident writer was given a lethal injection after a struggle with agents in the Saudi consulate in Istanbul on 2 October, a spokesman told reporters. 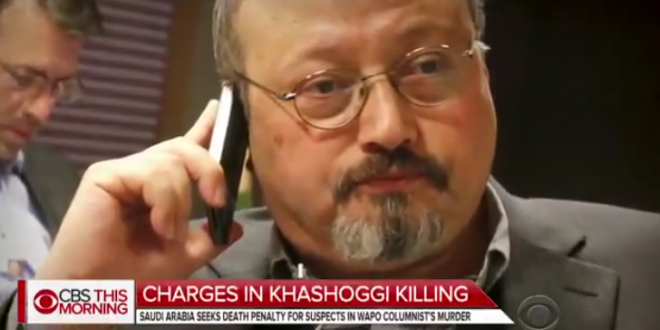 Khashoggi’s body was then dismembered and taken out of the building, he said. “[The crown prince] did not have any knowledge about it,” he added. Critics of Prince Mohammed, the son of King Salman and Saudi Arabia’s de facto ruler, believe it is highly unlikely he would not have been aware of the operation.